For a long time, I studied my father’s painting that bares the Latin title: Memorosa, an epithet translating as memory of the rose or the red. With my young eyes, I examined the brush strokes and masterful technique. The composition depicts three life size figures entering from the left: darkened men lancing a stumbling woman as she reaches out to save a luminous child in the bottom right corner. Above the rock, the moon is aglow, reflecting the light of the sun, which on the opposite side slices weakly across a cloudy sanguine evening light. The intuition led my perception of this work, which I naturally loved. But why? It was skilfully painted and depicted a gripping narrative, but was there something more? Later, after conversations with my father, I discovered alchemy: a spiritual path that gives one awareness about the nature and its reflections in the elements. 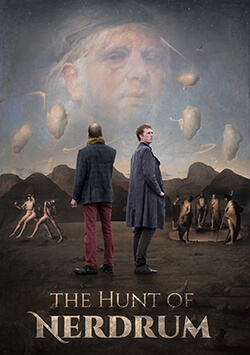 In recent years, Odd Nerdrum has been using a two-colored palette after Appelles’ technique, which consists of red, yellow, black and white. A half century before this great ancient painter, between 500 and 400BC, Greek thought was influenced, among others, by the melancholic philosopher Heraclit. Not only a great pre-Socratic thinker, he was also an alchemist, and should be considered one of the most important sources to its origin. One of the ideas he originated was the stage of four colors – the exact same colors Apelles would later use in his paintings; black, white, red and yellow. To briefly summarize Heraclit’s color-stages: black symbolizes the darkness, white – the illumination, red – the turning point, and yellow – gold, achievement or redemption. Heraclit’s stages actually describe our existence, and form the basis of today’s most known and practiced religions. It represents human life, but also an alchemical examination of the sun’s appearance on earth, which we experience every nychthemeron – every single day. Heraclit rightly pointed out that there are few human beings who will ever experience the red phase, the peripetia – in their spiritual life. After the discovery of alchemy, I turned back to the painting Memorosa with a clearer consciousness. I realized the image was both symbolically resonant as well as a realistic representation of the night unfolding. The motif reveals a quickly darkening sky, in which the evening sun is nearly extinguished. The red twilight, the turning point, is manifested in the female figure, plunged to the ground by three men – who represent the night. The child symbolizes the vulnerable remaining rays of the sunlight. The moon, which represents the illumination in Heraclit’s model, lights the way through the darkness and reappears as the lantern brandished by one of the soldiers. Apparently these are two identical events occurring simultaneously. In Nerdrum’s paintings, the background often reflects the events of the foreground, which helps to create harmonia. But what’s more: the figures are equally a theatrically staged image, a transformed examination of what transpires in the sky. The drama proceeds from the three darkened men at upper right in the composition, down to the little child. With the upperhand, the night shadows the blood red evening sun, soon disappearing behind the mountains. After analyzing the painting, I concluded that Odd Nerdrum had painted the sunset and the night unfolding incarnate as human beings. Christianity builds upon the same theme. 3500 years ago in Egypt, among many others, they worshiped the sun-god Horus who battled eternally against the god of the underworld, Osiris. At dawn, Horus would out match his opponent, sending him back to the underworld. Yet later in the evening, Osiris would return to reclaim the kingdom on earth which he embraced under his darkness. Today, it seems only the names of the two figures have changed: God and the devil. But Odd Nerdrum’s painting describes a more nuanced and poetic depiction of this timeless struggle. He recreates the way of nature, which applies to every single masterpiece ever made, whether sung, written or illustrated. Man is seen from a heliocentric perspective; figures are swinging with the motion of the celestial spheres – no longer mere human beings, but manifestations of the cosmos. Memorosa illuminates the moment when heaven and hell reunite, where fire meets ice, and the spirit melds together with the soul to form an alchemical alloy. It reminds us that we must remember the twilight. This brief, but beautiful moment, before the world is cloaked in darkness.